The name of the world’s fastest computer comes from the Japanese work ‘Kei’ meaning 10 quadrillion, a threshold that the machine aims to pass in terms of calculation speed. K Computer has been built by Fujitsu and is already a source of national pride for Japan. Located in Riken Advanced Institute for Computational Science in Kobe, K has set a new standard for speed, being three times faster than the previous owner of the title, a supercomputer in China, Tianhe-1A, and more powerful than the closest five competitors to the title combined. Its performances are staggering: roughly 8.2 quadrillion calculations per second, or in other words, 8.2 petaflops per second, and to get an idea of how much this is, imagine connecting around one million home computers together. This performance needs enough electrical power needed for about ten thousand homes, and yet K is called efficient in terms of power consumption. The 672 cabinets filled with system boards which form the computer will soon be raised to 800, increasing the machine’s speed even further. Apart from Japan, only the United States and China have held the title of having the fastest supercomputers. The rankings are held once every six months, providing data regarding the evolution of computers. For the time being, K is number one, but the USA is planning to come up with an even faster machine currently in development at University of Illinois at Urbana-Champaign, called Blue Waters. Supercomputers are used in various fields, ranging from earthquake simulations, climate modeling, nuclear weapons development and nuclear power tests, to stock trading and oil exploration. 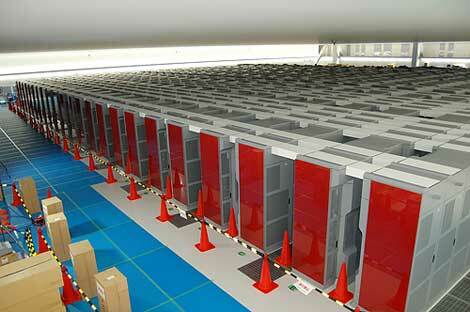 This entry was posted in News, Other and tagged japan, supercomputer by Dragos Schiopu. Bookmark the permalink.